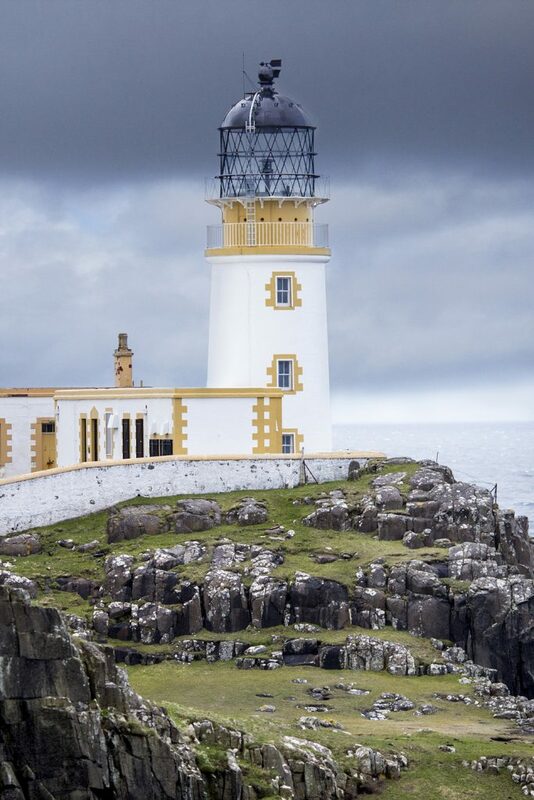 There are so many images of the Neist point lighthouse floating around the internet that at times it feels this is all the Isle of Skye in Scotland has to offer. 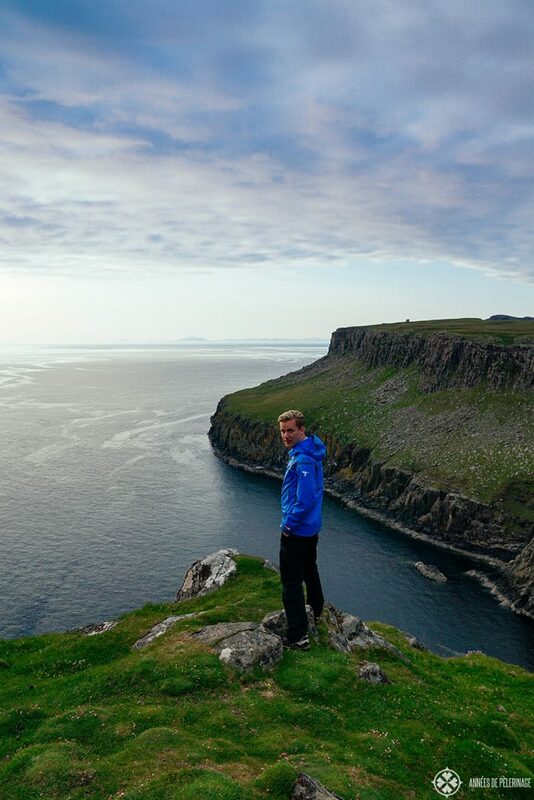 While this is certainly not true (do check my list of the 10 best things to do on Skye) there is no denying the high cliffs are beyond pretty. Here is what you should know before you visit. 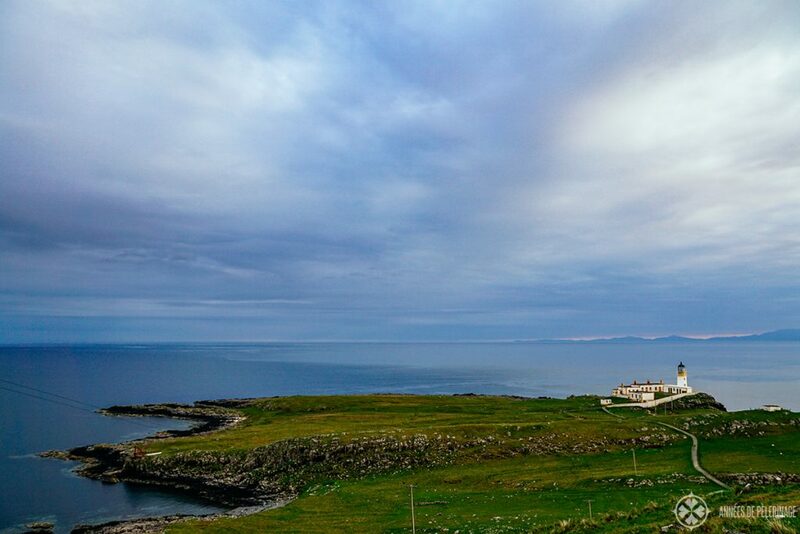 Visit not only because of the beautiful scenery but also because it’s an excellent spot to observe whales, dolphins, porpoise and even the occasional basking shark. Lots of common seabirds are also using the high cliffs of the Neist point as their breeding grounds. While you may not see the cute puffins here (they mostly stick to Lunga), gannets, razorbills, and black guillemots are quite plentiful. 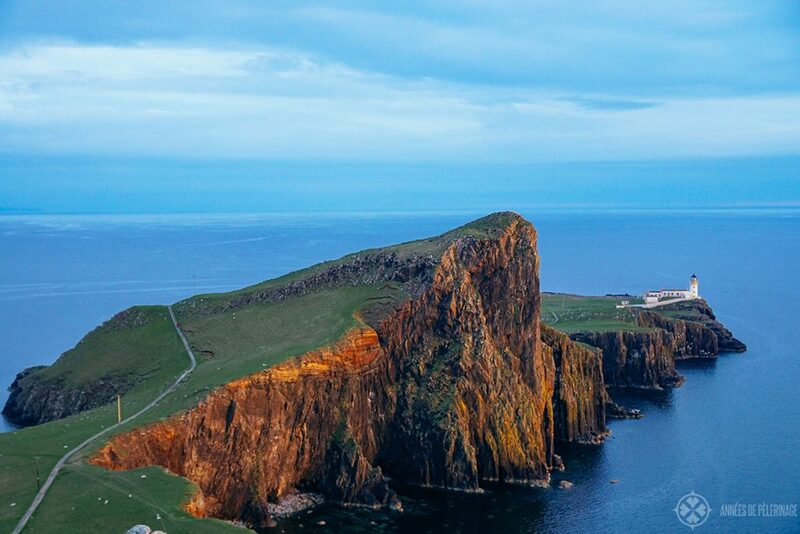 I really have to say that Neist Point was probably the most stunning spot I visited on my tour through Scotland, though it is somewhat hard to take a pick (here’s my list of the 20 best places to visit in Scotland). From the parking lot (for directions, see below) you can follow a more or less well-maintained concrete path directly to the lighthouse. The whole walk will take about 40 minutes up to one hour. There is a little shed and a trail branching off to the left, but you just have to go straight and then down the rather steep stairs. Once you reach the bottom of the stairs, you can continue onwards directly to the lighthouse, though I urge you to make a little detour and climb the highest points of the cliffs as well. There is only a little trail to get you there, so you’ll have to leave the concrete path for a while. Currently (at least the last time I visited) the keeper’s cottage is not open to the public, so you cannot get inside. Same applies to the lighthouse itself, which is still functional but does not require a keeper any longer. Can anyone do the walk to Neist Point? Especially the very first part of the walk is quite challenging, as the stairs leading down from the parking lot are very steep. Don’t expect sturdy handrails either. People suffering from vertigo will probably also not like some portions of the trails, but other than that it’s quite manageable if you take your time. The fact that there is a concrete path (and not just a trail) probably should give you a good impression that it was meant to be accessible for all ages and skills. If everything fails, you can walk along the cliff from the parking lot and still enjoy a very beautiful view of the lighthouse. 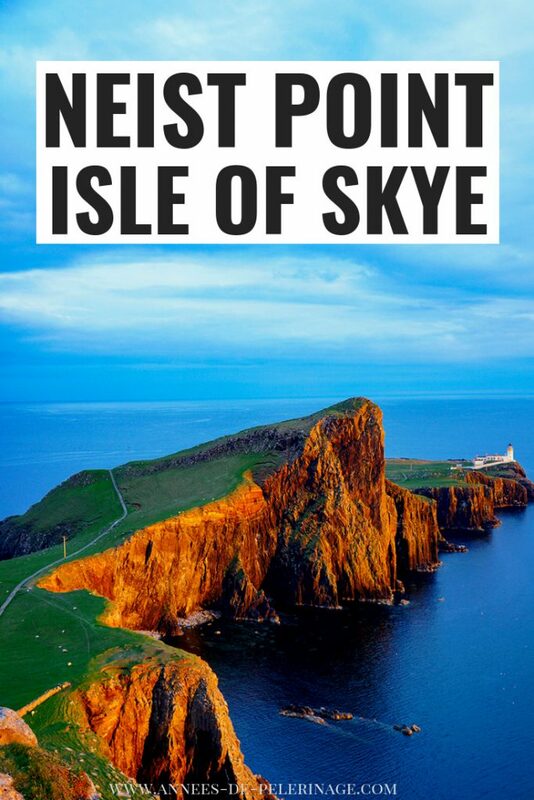 While Neist Point is certainly worth a visit even if you don’t need fresh content for your Instagram feed, I’ll acknowledge that many tourists coming to visit do want some form of lasting memento to bring home. There are three important spots you should know. The probably most scenic spot to take a picture of the Neist point is, ironically, not on the little peninsula at all. A little wall fences of the parking lot from the pastures beyond and you can easily turn right (at the shed) and walk along the cliffs. After about 200 meters you will be able to see an imposing panorama of the opposing cliffs and the lighthouse itself. 90% of all pictures of the Neist Point have been taking here. Do be careful, though. 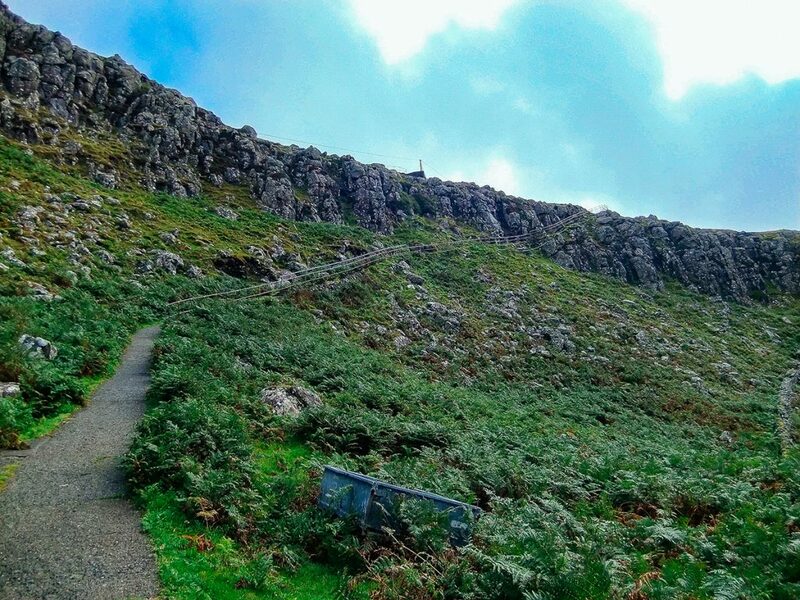 The cliffs are extremely high & steep, the grass can be slippery, and sudden gusts of wind are quite frequent. 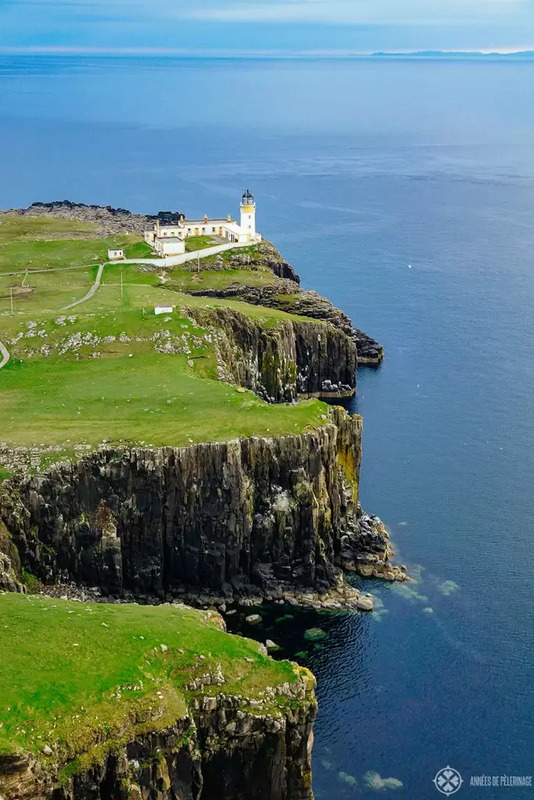 If you want to have a nice bird’s eye view of the Neist Point lighthouse, then definitely climb the little hill (the highest point of the cliff) in the middle of the trail. Again, be careful at the very top. It is quite impossible to miss the Neist Point from Portree, but I’ll spell out the route for you anyhow. Take the A863 to Dunvegan (make sure to drop by at the Dunvegan castle!) and then take the B884 towards Glendale. After about 2 Kilometers you need to turn left (there is a sign) and you need to follow a small single track road towards Neist Point. You do not need a 4wd car to get there. The road is, all things considered, just a standard road you will have no problem navigating. There is a parking lot at the start of the trail. 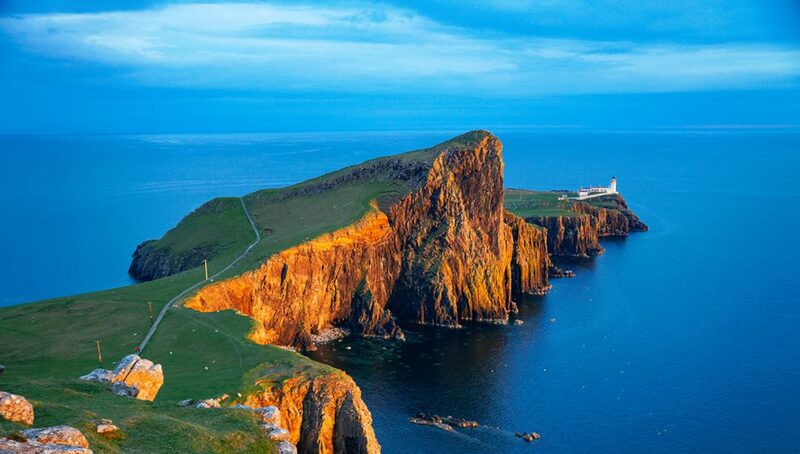 Note: In recent years Neist Point became increasingly popular among tourists. In summer, you will sometimes have trouble finding an empty spot for your car and the single track road doesn’t really improve things either. Is there a bus from Portree to Neist point? Sadly, there is no regular bus directly to Neist Point. There are regular buses to Dunvegan (Bus 56) which, depending on the season and time of the day, will also stop at Glendale. 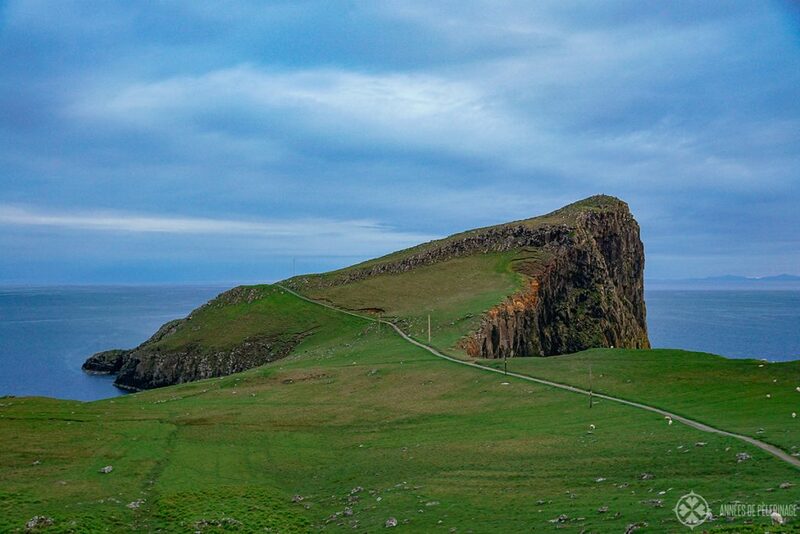 From there, you could walk to Neist Point (~3 kilometers). Note: Most buses are not designed for tourists, but rather for school children and the locals who need to go to the city. So, definitely check the schedule ahead so you don’t miss your return bus. Alternatively, you can also book one of the tours from Portree, if you do not have a car. 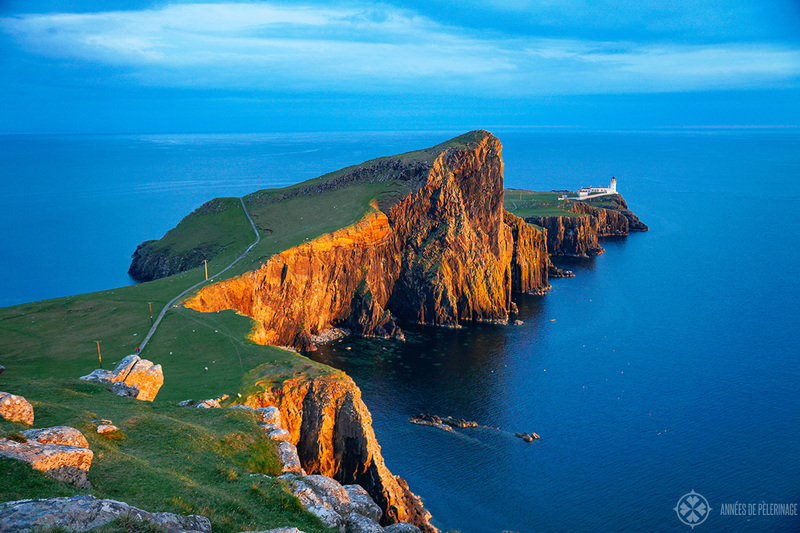 The best time to visit Neist Point is close to sunset (visit this website to find out when it is). Not only because the red-golden rays add to the whole setting, but also because it offers the most favorable light of the day (as the sun will only be shining on the north facing cliffs in the afternoon). Be careful to calculate some time to do the walk, as you don’t want to scale the steep stairs back to the parking lot in the dark. 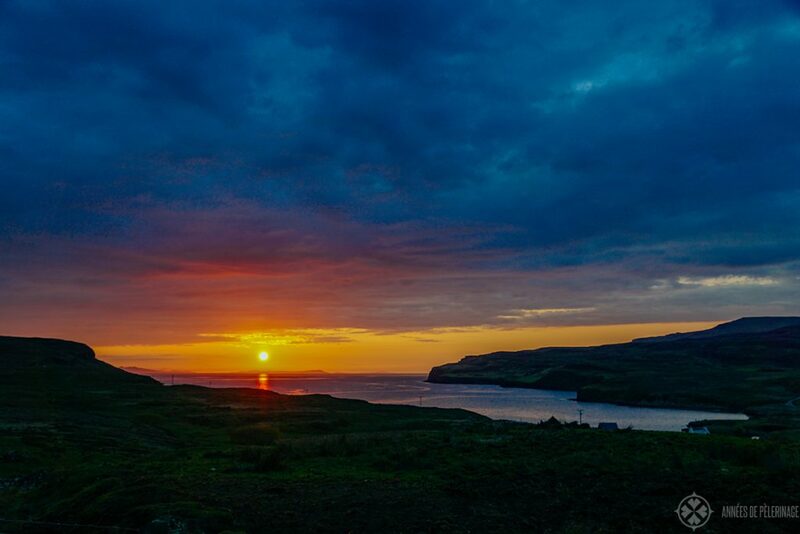 Also, keep in mind that the weather in Scotland is quite unpredictable and there are not a lot of days throughout the year when you can actually see a proper sunset (make sure to read my packing list for Scotland). It really pays off to check the weather forecast before your visit, because you will have a hard time actually seeing the lighthouse on a rainy day. Also, the path can be quite treacherous. 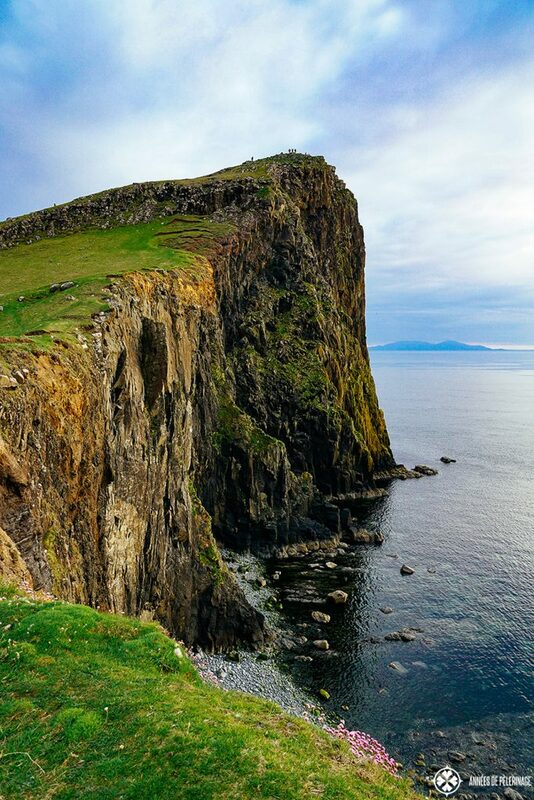 The cliffs at Neist Point are 100 meters high and more. There are no railings and the footing can be quite treacherous. This led to a couple of tragedies over the years. 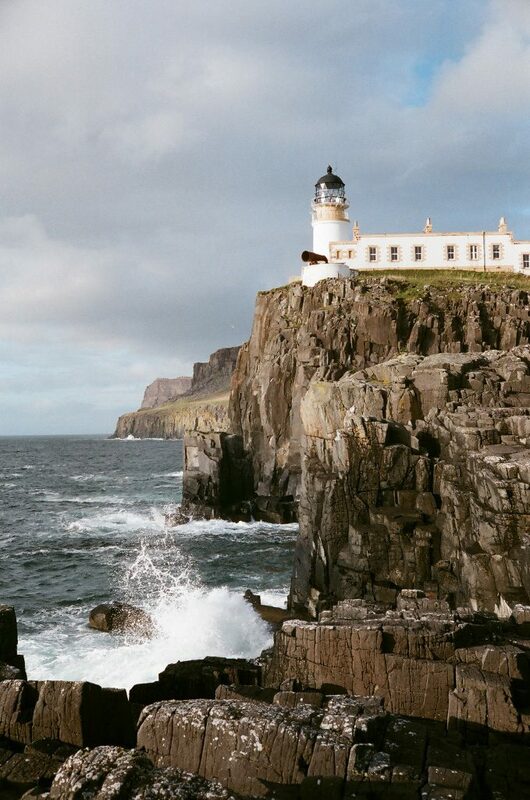 In 2013 a woman died after she plunged some 100ft down the cliffs at Neist Point. In 2017 another woman dropped down the cliffs at the tip of the Neist Point but the coastguard was able to rescue her. Apart from that, I could not find any hints towards further deaths at Neist Point, but it remains without a doubt that it can be a dangerous place. 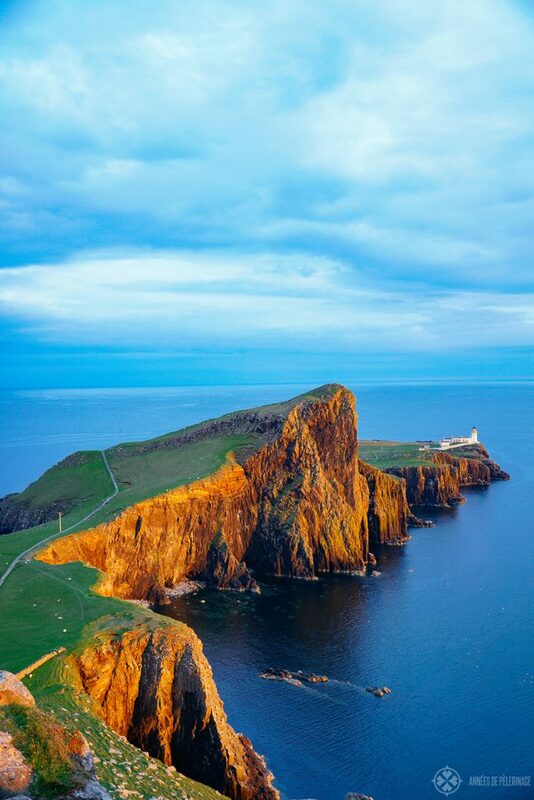 There is also a famous whiskey by Talisker called Neist Point. If you got the time, drop by at the Talisker Distillery on Skye to sample a tumbler or two of the Neist Point Talisker vintage (the distillery is nowhere close to Neist point, though). Thus ends my little guide to Neist Point on the Isle of Skye in Scotland. I hope I was able to give you a good impression of what to expect. Got any questions? leave them in the comments below. I hope to someday visit this lovely place.